Trenton Evening Times, January 8, 1917. Americans responded to President Wilson’s plea with gusto, providing a whirlwind of both money and manpower. In April 1917, when the United States entered the war, the American Red Cross had 555 chapters and 486,000 members. By 1919, there were over 3,800 chapters and 30 million members—18 million new members signed up during the 1917 Christmas Membership Drive alone! 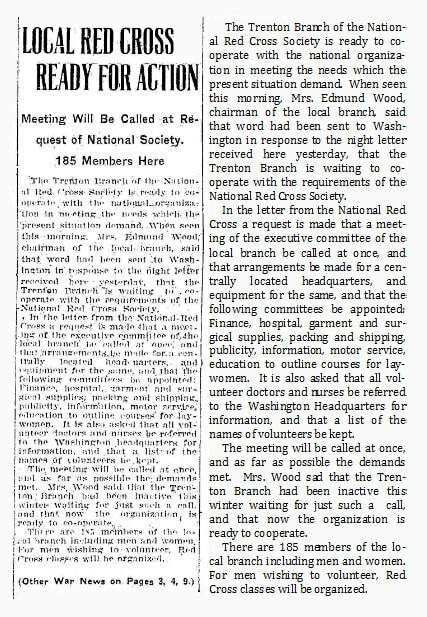 Trenton’s chapter of the Red Cross boasted 185 members in 1917; after the Christmas Membership Drive, Trenton’s chapter ballooned to over 36,000 members. Such a robust and dedicated organization of volunteers necessitated a work space to headquarter their activities. Trenton Evening Times, February 5th, 1917. 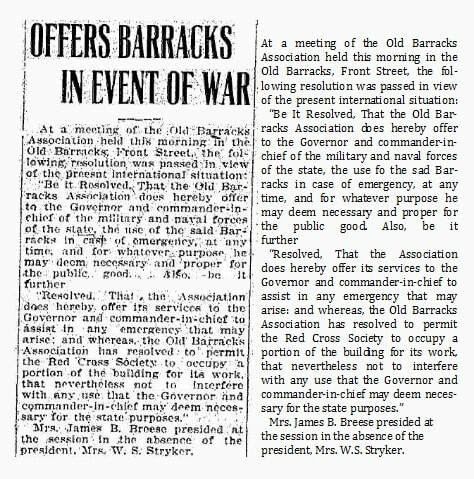 A few weeks after President Wilson’s letter was published, members of the Old Barracks Association convened several meetings to discuss alternate uses of the building during wartime. Minutes for their February 8th meeting note that the Association offered the building and the Association itself to the Governor for any purpose he deemed “necessary and proper for the public good.” Additionally, the Association resolved to permit the Red Cross to utilize “a portion” of the Barracks for its war work. Trenton Evening Times, February 15, 1917.